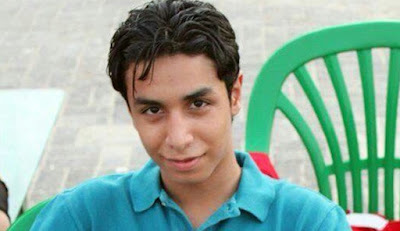 The mother of a youth facing beheading for taking part in protests in Saudi Arabia has pleaded with US President Barack Obama to "rescue my son" in an interview published by the British daily the Guardian Thursday. The sentence against Ali al-Nimr, a Shiite Muslim who was only 17 when he was arrested in February 2012, has drawn international condemnation over his young age and allegations that he was tortured into making a confession. "When I visited my son for the first time I didn't recognise him," Nusra al-Ahmed told the newspaper. "I could clearly see a wound on his forehead. Another wound on his nose. They disfigured it. Even his body, he was too thin. "For a month he was peeing blood," she added. "He said he felt like a mass of pain, his body was no more." In an interview with AFP last month, his father Mohammed al-Nimr said he hoped the king would save his son and warned that if his son is put to death the minority Shiite community could react violently. And just yesterday I read of the terror of the Afghan peoples in the areas where ISIS is fighting even the Taliban. They said that no Jew nor Christian ever afflicted Muslims with such terrors and violence. Of course, the ISIS troops espouse the Wahhabi version of Islamic practice, the true horror of rational fiqh - the human understanding of Shari'a as has been spread throughout the world by the oil money of the Saudi elite. To paraphrase William Jennings Bryan, "You shall not crucify mankind upon this Cross of Oil!" American cartoon by Grant Hamilton, 1896, on William Jennings Bryan's ' Cross of Gold' speech at the Democratic National Convention in Chicago, which won Bryan the presidential nomination.